Who doesn’t love a road trip? Driving long distance conjures up a feeling of freedom, and usually comes with good music and a side of fries. But what really makes a road trip memorable are the stops you make along the way. Covering 4,000 miles and showcasing eight unforgettable roadside marvels, here’s your coast-to-coast guide to the ultimate roadside attraction road trip. P.S. if you want to follow along on this road trip, we've put together this road trip map with all the stops mapped out for you. Maine, a state with an abundance of water and trees, is about as opposite of a desert as any place can be. 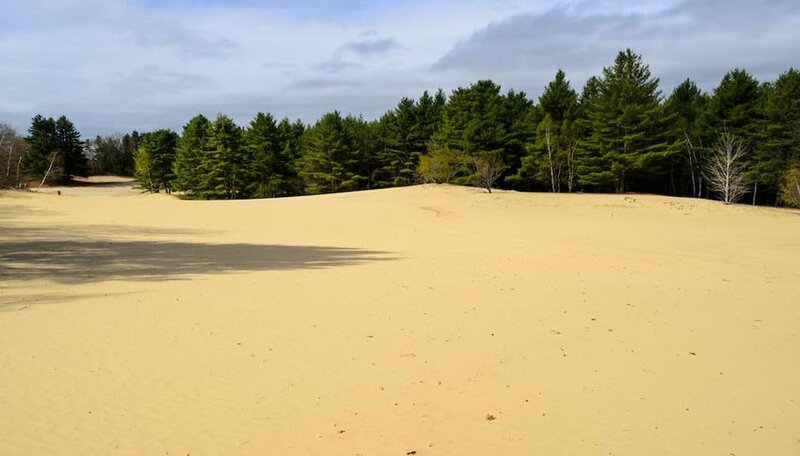 That’s why the Desert of Maine, located in the coastal town of Freeport, is so bizarre. With 40 acres of sand and silt, this attraction is a shock to the senses. How is such a place possible in Maine, a state that averages 46 inches of rain per year? A combination of glacial silt and incorrect farming practices turned this once lush-farmland into a desert-like landscape over 200 years ago. Even though the area is surrounded by a mix of deciduous trees and conifers, the land itself remains strangely barren, making it the perfect first stop on your road trip. Just don’t forget to grab a lobster roll on your way out of town. The World’s Largest Kaleidoscope is located inside a silo at the Emerson Spa and Resort in the Catskill Mountains. Designed by a world-renowned kaleidoscope artist, this roadside attraction is a complete visual and auditory experience, with music, lights and mirrors giving visitors the opportunity to witness a kaleidoscope’s chromatic prisms from all angles. At 56 feet tall, the kaleidoscope is officially the largest in the world and has been certified by the Guinness Book of World Records, according to Emerson Spa and Resorts. It’s a pretty trippy experience that draws tourists, hippies and kaleidoscope enthusiasts from across the globe. Would you like to visit the woman who lived in a shoe? Then this next stop is perfect for you. Originally built in 1948, the Haines Shoe House was conceptualized by Colonel Mahlon Nathaniel Haines. Haines, who owned several shoe stores, built the shoe house as a marketing strategy. When he didn’t stay there himself, he offered his home up to honeymooners who had purchased his wares. 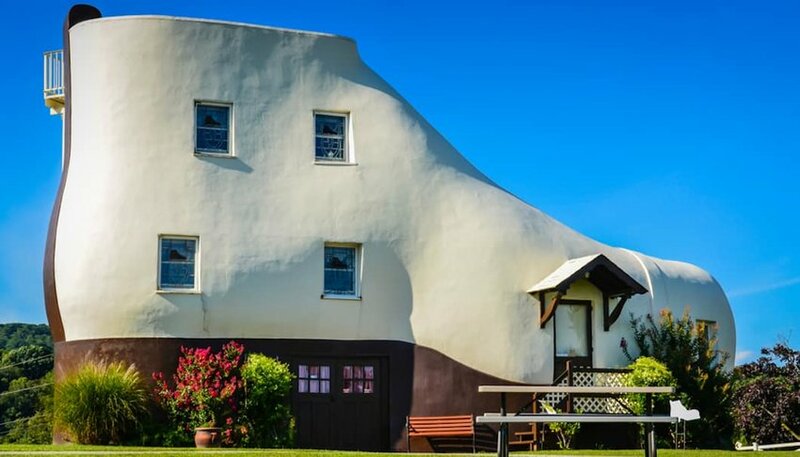 Today the owners still open up their unique, shoe-shaped abode to passers-by for tours and ice cream, making it an ideal stop on your road trip. 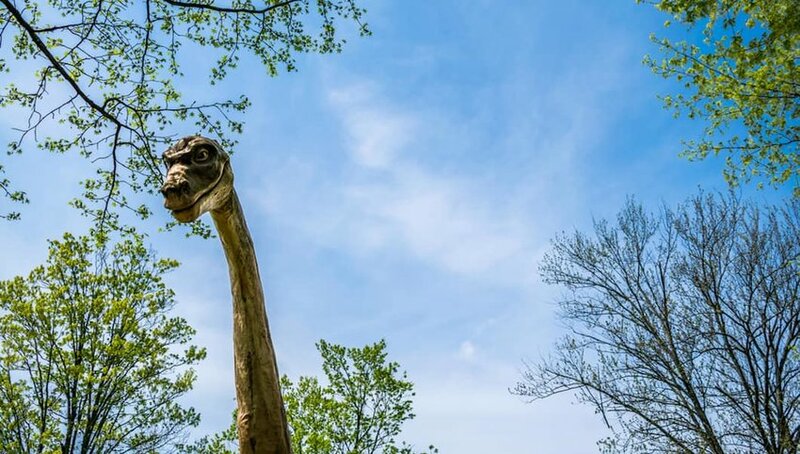 Dinosaur Kingdom II isn’t just any roadside attraction filled with life-sized dinosaurs — it’s also a slice of history. The history may be entirely inaccurate, but that’s okay. Dinosaur Kingdom II’s elaborate scenes depict epic battles between Civil War soldiers and dinosaurs. Celebrity features include Abraham Lincoln, Stonewall Jackson and a mad scientist whose time machine is responsible for the mayhem. The roadside attraction comes with an entire background story that explains the fantastical circumstances and is worth a visit if you’re willing to suspend your belief in time travel for just an hour. The next stop is another title-holder in the Guinness Book of World records: the world’s largest underground lake. 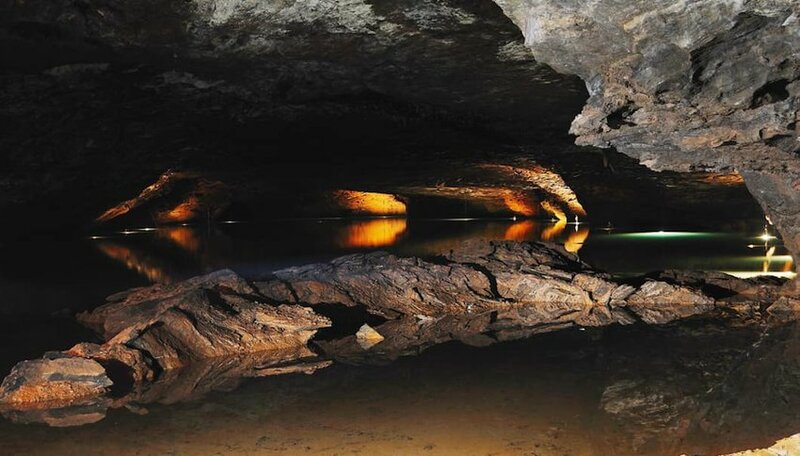 Discovered a little over a hundred years ago, the aptly named Lost Sea is hidden inside a network of underground caves in Tennessee. To reach the Lost Sea, visitors first descend into the depths of the cave, 140 feet beneath the earth. Upon arrival, glass bottom boats are available for traversing the 4-acre lake. The lake extends into several other water-filled rooms that can only be accessed by cave divers. Spelunking and an underground lake that is seemingly endless? Sign us up. 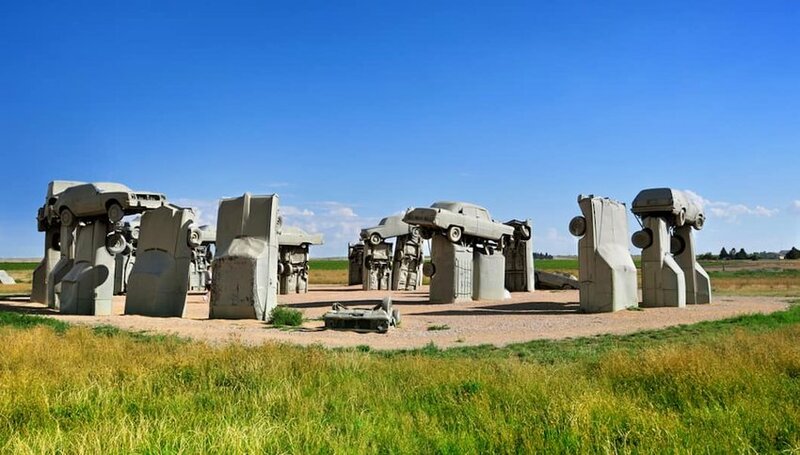 If you don’t have enough funds to travel to Stonehenge in England, why not settle for Carhenge in Nebraska instead? This extraordinary roadside attraction, created by artist Jim Reinders, is a replica of the famed Wonder of the World, and a wonder all unto its own. Built with 39 cars and covered entirely in gray spray paint, the full-scale reproduction was dedicated on the Summer Solstice, a nod to Stonehenge’s pagan roots. Far from any major roadways, it’s slightly off the beaten path, but well worth the extra mileage. Not far from Death Valley sits the ghost town of Rhyolite, a gold rush settlement that was occupied for a brief time in the early 1900s. 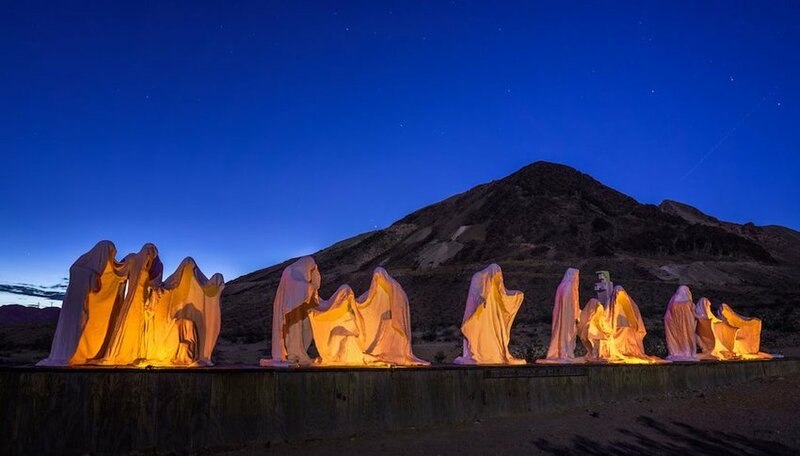 Above the empty town, stands an installation of 12 hooded, faceless figures, dressed in white and ghost-like in nature. This life-sized sculpture bears the same name as its inspiration, the famed Leonardo da Vinci mural, The Last Supper. The artist, Albert Szukalski, found the Nevada desert landscape reminiscent of the Holy Land and crafted this piece as a result, according to Atlas Obscura. These fiberglass statues are sure to evoke some type of feeling, be it awe-inspiring or chilling, so you may as well stop to see what it brings out in you. 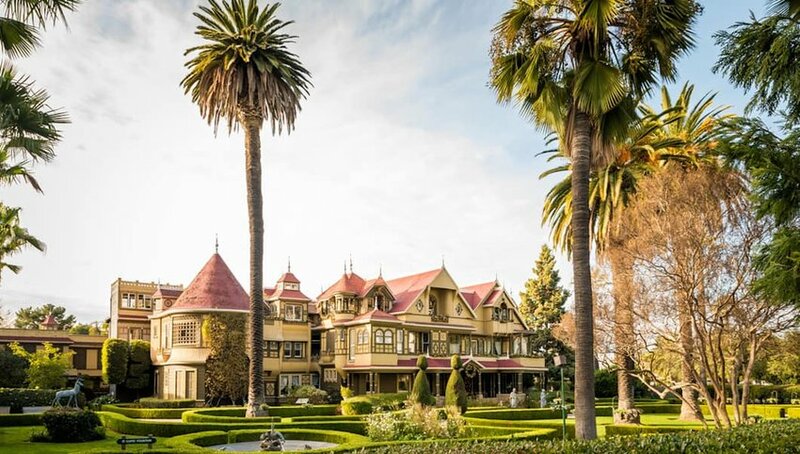 Our epic road trip concludes at Winchester Mystery House, a 24,000 square foot mansion not far from the Pacific coast. The home was originally built in 1886 by Sarah Pardee Winchester, heir to the Winchester gun fortune. An interesting character and inventive woman, Winchester continued to add on to the house for 38 years. As a result, the house is massive and has several oddities — a door and stairways that lead to nowhere, secret passages and a seance room used to communicate with the spirits. While some people believe that Winchester’s eccentric home is simply a matter of her imaginative spirit, others claim there is a more sinister purpose behind the house. According to lore, spirits commanded her to build a house that would become home to all the people who had died from Winchester gunshot wounds. Sarah Pardee Winchester dutifully obeyed and this incredible roadside attraction is the end result.